The cold still bites here in Royal Berkshire, but at least the sun has managed to put his hat on occasionally, and to lovely effect. That said, yesterday was mostly filled with flurries of snow flakes, and the daffodils are terribly confused. 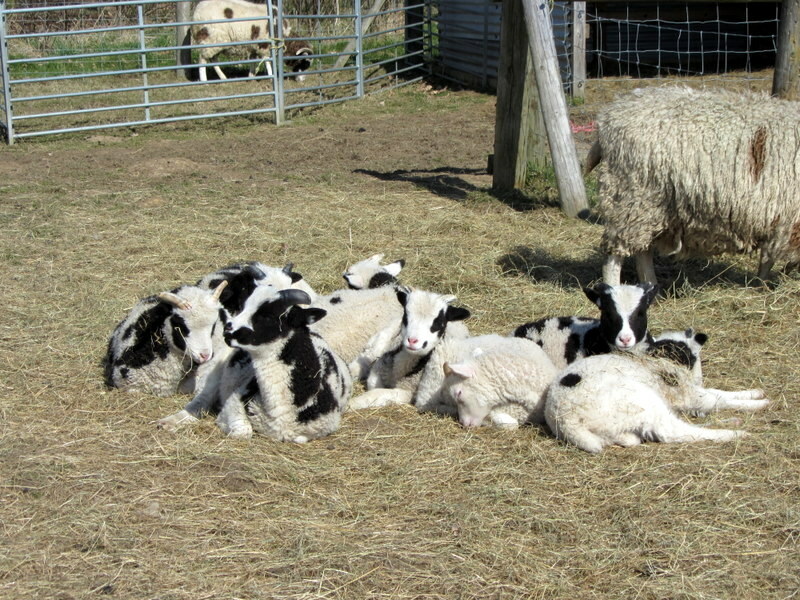 One effect of the sunshine is to encourage a little ritual lambs are fond of indulging in. After joining in the feeding frenzy on barley and hay with the ewes, they like to have a little chill time and think on the eternal verities. And they like to do it together. Normally in the sun they would play, but in the recent bleak and freezing weather they prefer to act like solar cells, and soak up as much warmth as possible. 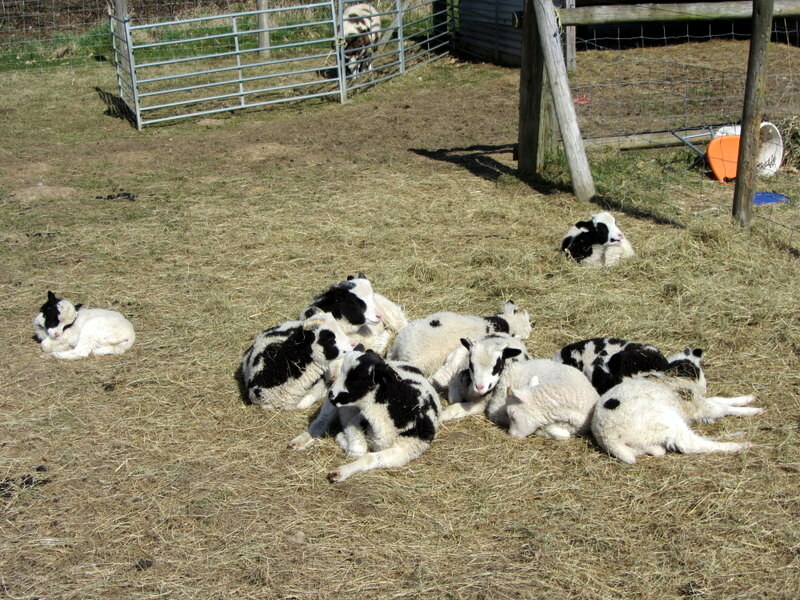 It begins when a nice bed of strewn hay is found in full sun. 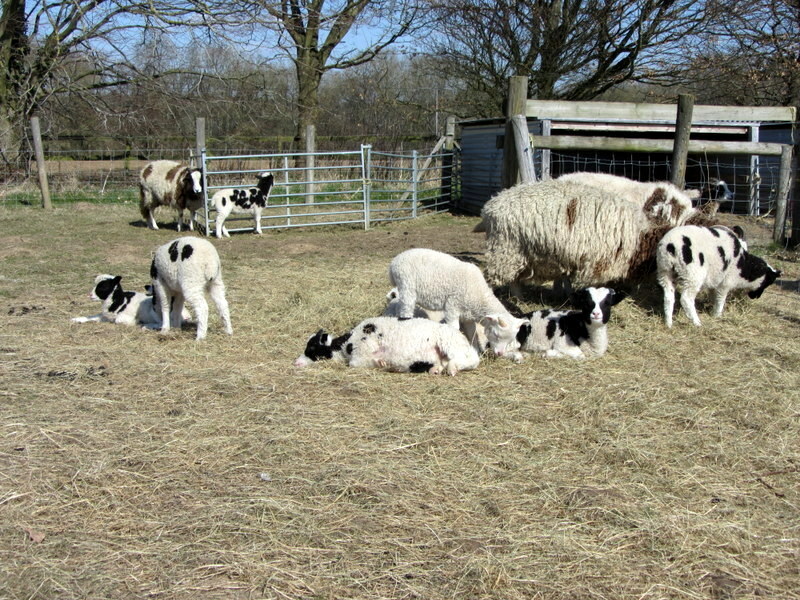 A couple will settle, satisfactorily gorged for now, and other lambs decide that they have the right idea. Quickly you have five settling in for some sun. And soon there are six, as a couple of the early comers start warming to their task of… warming. After some maternal intrusion and subsequent re-arrangement, they resettle to reveal the sun-and-slumber party has grown to eight. 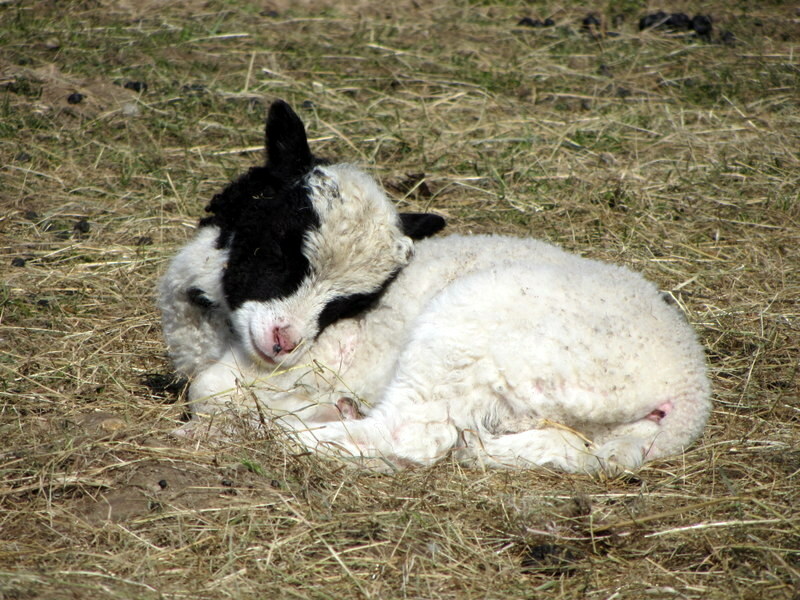 Malcolm, the youngest, is very much his own lamb and sits off a little to the side, balancing community with independence… and sleep. And looking back to the main assembly we find the other nine have finally settled together, Cher, the only girl among them, showing a suitable juvenile female disdain for boys. And they shall stay till the next human diversion arrives; for now, I have become far too boring to notice. Previous Post **Blushes** I’ve been liebstered. Yes, I guess I am fortunate. Too often I take such things for granted. Thank you for the wake-up call. 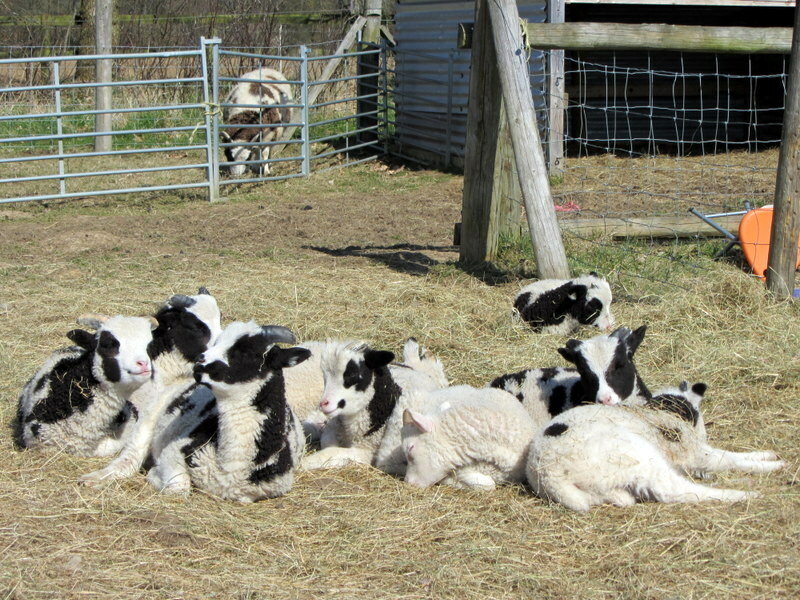 I love all the stories about the farm – the photos and captions are a moment of peace amidst the usual emails. At first I thought to suggest you create a children’s book; but then I realised that everyone will love these darling sheep, and the other farm animals. They just bring joy to the soul ! It really is cheering to know that some of you find some joy in our sheep and lambs. To be honest, I usually worry that I am being self-indulgent when I upload sheep posts. But it seems to be a self-indulgence others happily share. And they are a joy indeed. Cute aren’t they. If you click the pictures they get a little bigger, but they are much reduced so I do not chew up everyone’s bandwidth. While I only handle them at birth and leave them be otherwise, the lambs are so used to me now I can get close without drama. In fact, they regularly come up and nibble me. Cher did so before she joined the boys for the sunshine love-in. So gorgeous. 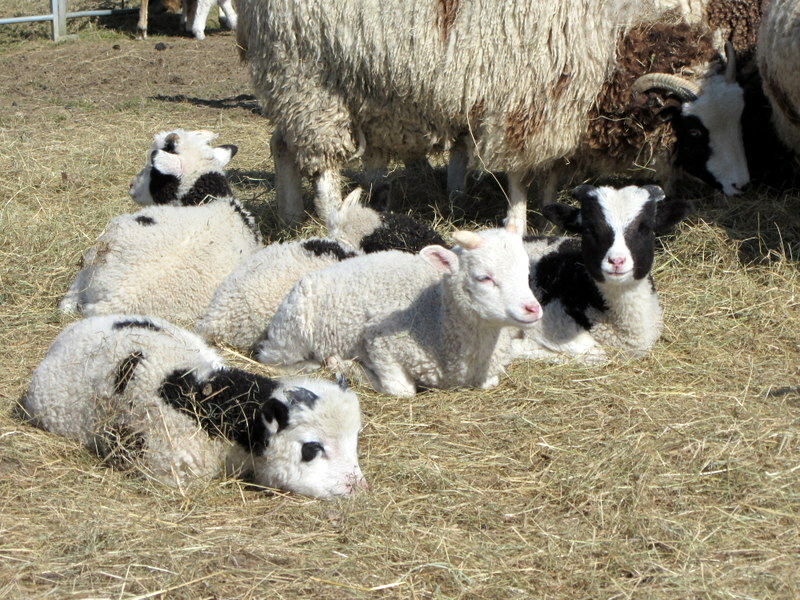 Something special about baby animals, and in particular, lambs. Is it their innocence I wonder? The joys of springtime! 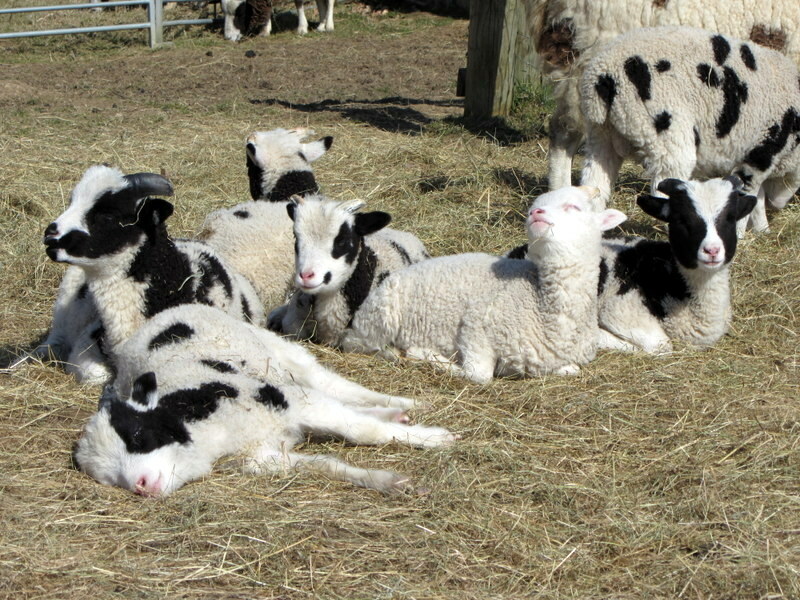 What happy pictures; I just wish I could bury my face into the soft side of one of those little warm lambies…..
That’s a good instinctive thing to do: they are very soft and they smell divine!